Couch Co-op: Deck-Building: Play It! One of many deck-building games produced by Cryptozoic Entertainment. Finally, we got tired of asking ourselves that question, and my friend bought it. That evening, the two of us opened it up, read the rules, and started playing… We were hooked instantly. I enjoyed the game so much that I went back to Barnes & Noble to purchase my own copy. Since then, I have gotten several of my friends addicted to this fun strategy game. This type of game allows you to play as a main character from the movie, such as Gandalf, Aragorn, or Frodo. The goal of the game is to have the highest number of victory points at the end which is earned by buying artifacts, heroes, locations, and enemies all to “build” your deck. All the while, you have to defeat the Arch-Enemies in order to finish the game which include foes such as the Nazgul, the Witch-King and Saruman. This is a perfect game for a group of friends. Although you can play with as little as two people, I have found that the best playing experience is with the maximum of five players for a more balanced and challenging experience. Also for those who have the movies memorized by heart, each card is named with a specific phrase from the movie, such as “It comes in pints?” Each card also features iconic shots from the movie which adds to the overall immersion into the game. Although they vary slightly between them, each game basically consists of your hero card and several deck cards which include allies, equipment, locations, maneuvers, villains, and super-villains. 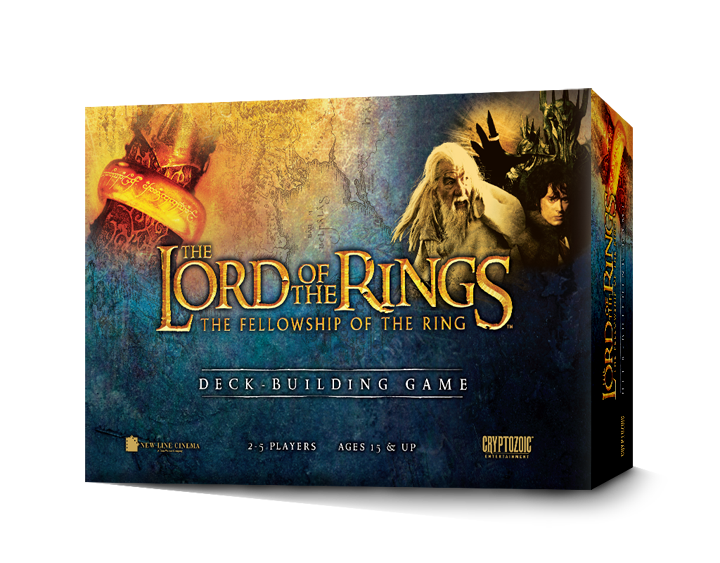 The Lord of the Rings: The Two Towers is also available for sale. It is a separate game which functions exactly like the first except with different cards and Arch-Enemies and with some additional rules to make the game more interesting. I would suggest you check Fellowship before this one, but they are independent games and do not require their predecessors. Expect Return of the King to be released sometime this winter. 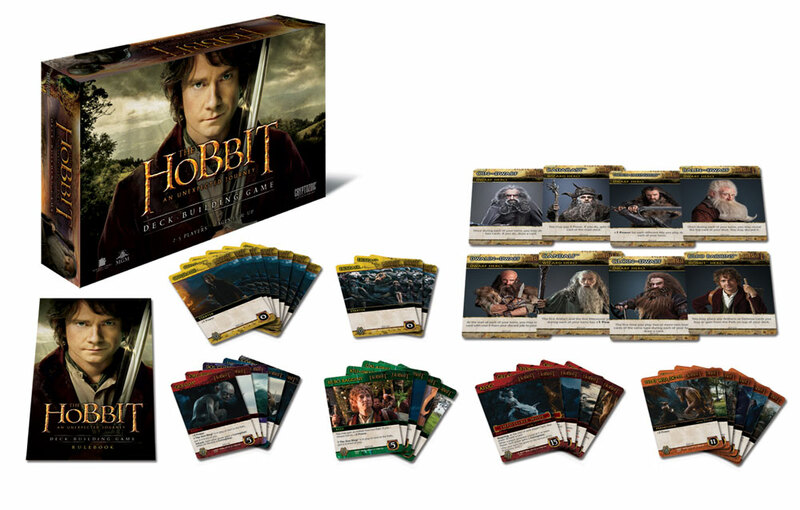 And just last month, Cryptozoic released The Hobbit: An Unexpected Journey which I cannot wait to play. 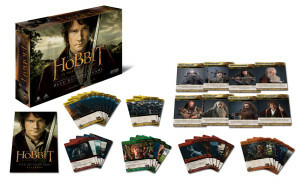 Cryptozoic plans on releasing expansions to The Hobbit which will add new cards and challenges to cover The Desolation of Smaug and The Battle of Five Armies. Is The Lord of the Rings not your thing? Well, no worries! Cryptozoic has a whole list of deck-building games to choose from including DC Comics, its sequel DC Comics: Heroes Unite, Capcom Street Fighter, and Naruto Shippuden. Because I am very fond of DC Comics, I really enjoy their deck-building games. I love the artwork on the cards which mostly come from The New 52 and some significant pieces such as The Killing Joke and Blackest Night. These run off the same game function that Cryptozoic calls the Cerberus Engine which makes it relatively easy to move from one game to the next. What is great about these games is that they come complete with everything you need. There is no buying booster packs to try to make the game better. 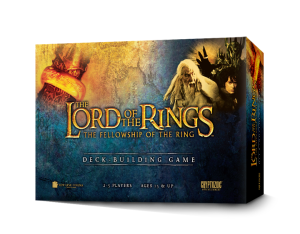 As an added feature to the newer releases, such as Fellowship and Two Towers, the game includes an “impossible mode” which is an even more challenging way to play once you are very familiar with the game. The DC Comics: Crisis Expansion is a recently released add-on to the original DC Comics and works with the sequel too. This expansion consists of 32 new cards to add to the original as well as an “impossible mode” which goes through each of the crises throughout the DC lore. (Note that the expansions are not stand-alone games!) Plus, look out for the new DC Comics: Forever Evil coming this winter! There are several deck-building games out there made by all different companies. However, I find Cryptozoic’s to be the easiest to pick up. These are definitely great for a game night with your friends with a number of play modes to choose from. What deck-building games have you played? Let us know in the comments!